Discussion in 'Feedback' started by Phillip, May 3, 2003. 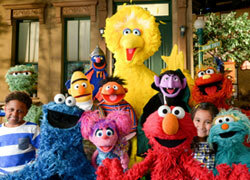 Doo Wop Hop from Sesame Street 25 Wonderful Years. I have this cassette I can send it for Muppet Central Radio if you want it Philip. Hi Phil, just wondering if MCR will be premiering the songs from MMW individually now that the movie's less than three weeks away like what was done for The Muppets back in 2011. Thanks and have a good weekend. Looks like MMW is finally here, Ed. Yep, Phil posted it had been added to the rotation yesterday in the Announcements section. 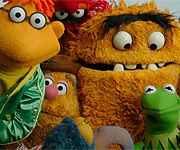 Unfortunately, as I said elsewhere, the RadioTerra MCR station cuts in and out and I haven't rully been able to listen/enjoy Muppet music today. Caught a portion of Welcome To The Big House that made me smile, hoping to plug in tomorrow or Monday. Glad to be listening to MCR through the RadioTerra link again... That said, when the station plays the song "Something So Right" from MMW, it gets to the duet between Piggy and Kermit, and then it skips a groove starting from the beginning a second time. Dunno why this happens, hope it can be corrected. Also looking forward should the songs from Rocky Mountain Holiday and Muppet Beach Party are added now in the summer months. Thanks for letting us know about this. It's been fixed. Yes, both will be playing soon. I like the 4th of July music. I also like the A Capitol Fourth music. Haven't seen "Venus" played on MC Radio before. Are there any songs that were added recently? Songs from the Lady Gaga special have been playing for several months. Yes, new songs are currently being added regularly. Also, Christmas Suggestion: The Fourth of July/Christmas medley from the Hal Linden episode of TMS. I would suggest some songs from the Sesame Street Fever album. Er, that entire album is already part of MCR's regular rotation. Yes, those songs also play here, please don't spam this thread as it's meant for comments/thoughts based on the station's playlist. Hm, I'm kind of surprised MCR hasn't started the 2nd annual Jerry-thon in remembrance of his passing on this day two years ago. Even still, listening to MCR is a good therapy to brighten my day, thanks Phil. Edit: Looks like I spook to soon as the Jerry-thon has begun! Yay! Thanks again for all you do Phil. Hm, I'm kind of surprised MCR hasn't started the 2nd annual Jerry-thon in remembrance of his passing on this day two years ago. *Keeps counting how many of Jerry's characters get featured so far. What happened to the Muppet Central Jerry-thon?